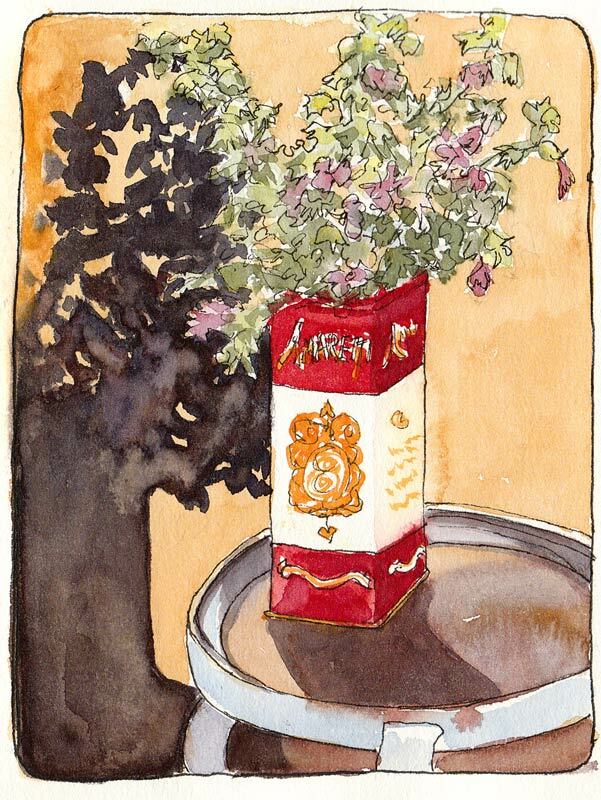 Lavatera Clippings in Amaretti Cookie Can, ink & watercolor,7x5"
I love this old can that once held Amaretti cookies. After trimming some branches off the giant Lavatera bush by my deck, I decided to paint the cuttings. The cookie can was the first thing I spotted that would hold water and flowers. I used the new Schmincke watercolors palette I recently bought on sale at Wet Paint. I love the palette but after a few trials, added and replaced some colors which I’ll write about next time. The Schmincke pan paints worked beautifully in the hot sun, releasing juicy flowing paint with just a touch of a wet brush. I think the sketch captured the feeling of heat and strong light and the funky little table with a dirty glass top looks just like itself. This is beautiful! Love the shadow! Great sketch. As Carol said the shadow is fab, perfect to suggest the heat as you wanted.